Applications are invited in prescribed format for the following post in the amalgamated establishment of Deputy Commissioner, Lakhimpur in the Scale of Pay PB Rs. 22,000 - 87,000, Grade Pay - Rs. 11,500 PM and other allowances as admissible under the rules. 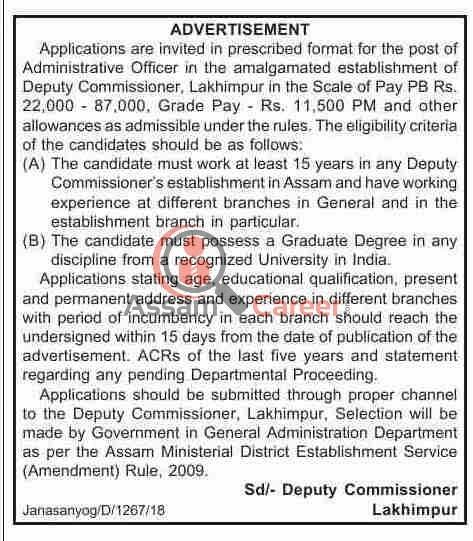 (A) The candidate must work at least 15 years in any Deputy Commissioner’s establishment in Assam and have working experience at different branches in General and in the establishment branch in particular. (B) The candidate must possess a Graduate Degree in any discipline from a recognized University in India. How to apply: Applications stating age, educational qualification, present and permanent address and experience in different branches with period of incumbency in each branch should reach the undersigned within 15 days from the date of publication of the advertisement. ACRs of the last five years and statement regarding any pending Departmental Proceeding. Applications should be submitted through proper channel to the Deputy Commissioner, Lakhimpur, Selection will be made by Government in General Administration Department as per the Assam Ministerial District Establishment Service (Amendment) Rule, 2009.